The lining fabric is a thin stretch fabric with a silky smooth finish on the printed side and thinking it was perfect for my Wilona jacket. As I mentioned in my last post I am using Mccalls 5978, which is a cardigan & sleeveless top pattern with sleeve variations and trim options. 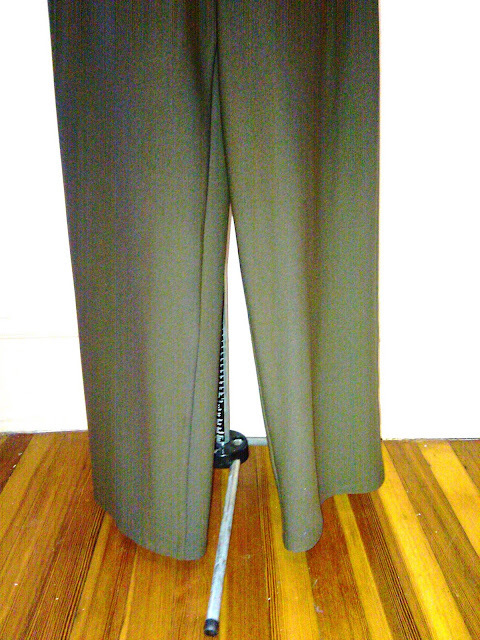 The pants are completed and just waiting to be paired with something. 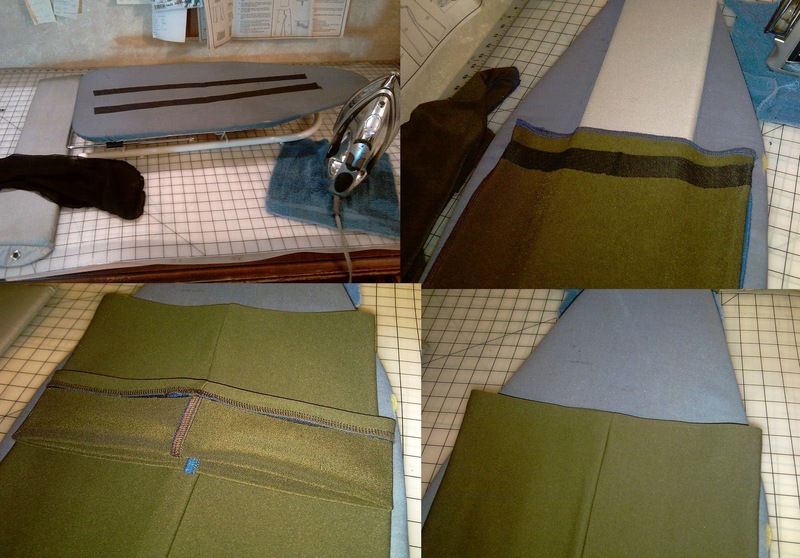 M5978 has back & front facings and attached the lining to the facings..... check. 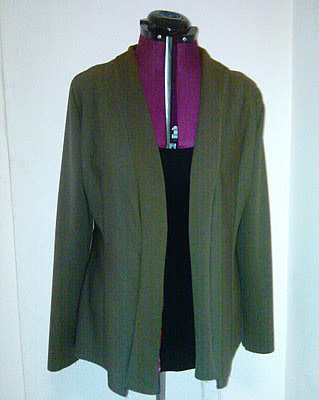 With right sides together, serged lining to jacket shell.... check. Tried the jacket on and immediately the facing rolled to the outside and the neckline looked jacked up. WTFrock! I am totally miffed as to where I went wrong and to think about picking out serger stitches is beyond my comprehension right now... seriously. So the Wilona jacket is being set to the side.... just maybe I was being a lil too ambitious with the whole Wilona fiasco...lol ... just look at my lining.... totally out there. 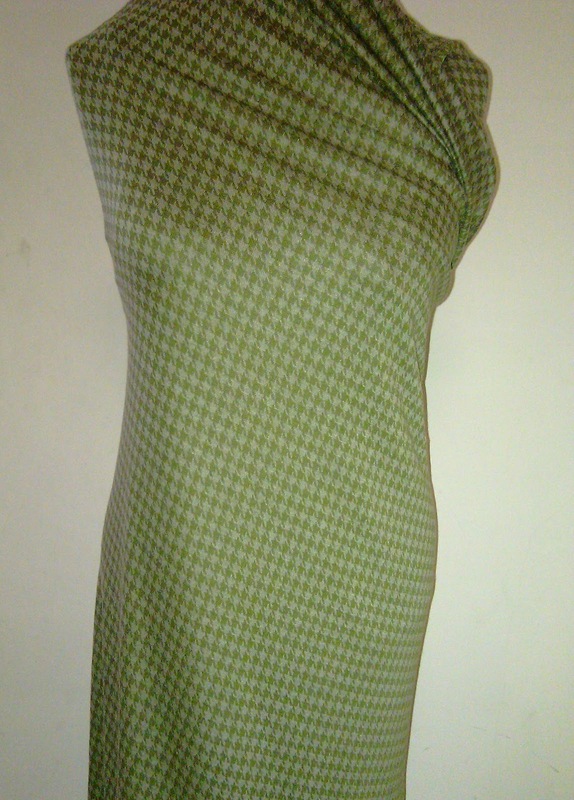 In the meantime, I've extracted this olive houndstooth knit fabric from my stash. It looks like a good candidate for this pattern... Butterick 5680: Loose fitting wrap/jacket with variations A: button and buttonhole shoulder closure, B,C: front extends into shawl collar. D: front extends to back, no side or shoulder seams. Purchased pin; wrong side of fabric will show. E: V-shaped neckband, stitched at sides. I like View D for its cut-on sleeves, but do not favor the back. I found one review for B5680 by Barbara of Sewing on the Edge and really like it on her. She mentioned that there was significant ease in the garment. So now I have to figure out which size to cut and have the Xsm-Sml-Med sized pattern and also thinking of going with View B instead. However, I want sleeves and wondering if I could use the sleeves from View C.
While I mull over the B5680, I thought I share how I hem my garments. I used Pro-Tricot Deluxe Interfacing from Pam @ Fashion Sewing Suppply. I LOVE IT.... She has an Awesome Sale going on right now... check it out. no stitching shows on the rightside of the fabric. I really loved that knit outfit and hope you are able to take the time to remove the lining and make this jacket work for you. I have that same houndstooth fabric in my collection (sav-a-thon) also and yesterday I pulled it out trying to decide what to do with it but now I know after seeing your post. I think the lights went on in my head and I will be adding this pattern to my list. 1. Use pointed embroider scissors to snip the lower looper threads (the ones that look like triangles, not the loopy ones). Be careful not to pull or drag the thread; just cut. Cut the threads for the entire length of the seam. 2. Find a couple of upper looper threads near the beginning of the seam. You may need to snip a few upper looper and/or needle threads to get it started. 3. Slowly pull the upper looper thread in the direction opposite of the start. Since you cut all of the lower looper thread, the upper looper thread aren't attached to anything! The thread should come off in one long piece. 4. The needle threads are now no longer attached to anything and should come out just as easily. I'm telling you, this takes less than 2 minutes to do if you cut the right threads. It's a pain to clean up, but really easy! ahhh, so sorry but as Tim G says "Make it work". I love the pattern you have as backup, and like View D though I hear your concern about the back. Seems like a little too much going on back there. I hope you can find a solution for your lining/jacket problem. 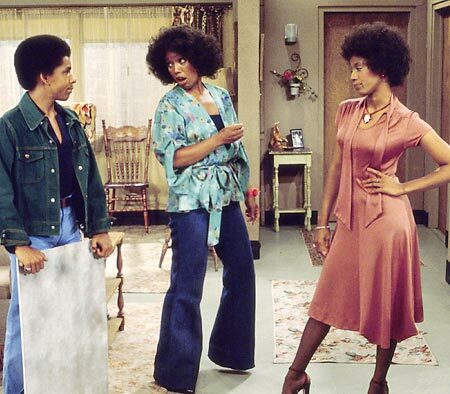 I think the jacket,top & pants are a terrific outfit. 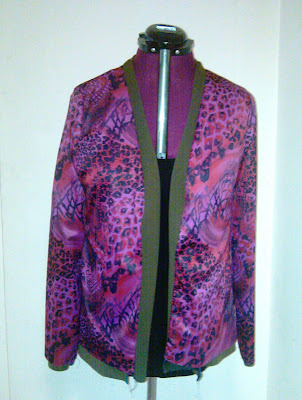 I think the wrap jacket/vest is very different and will look fantastic in the houndstooth fabric. You have very impressive sewing skills and I hope you solve the problem you have with your jacket. That view D on your next project is so different I love it, the back is the best part. I like the outfit. I can understand your frustration about the lining, though. I usually underline the fabric, use the facings as instructed and do a bias binding around the armholes. Salvage it. It is a great looking outfit. Can you stitch in the ditch at the shoulders to keep the lining in? I did that on a dress yesterday to hold the facing in and it works pretty well. I love the olive houndstooth. I, too, am going to buy this pattern. I really like wearing soft jackets that give warmth but look a little more stylish than a cardigan. Wow Sheila, this would be a "knockout" I really hope you can take the time to "make it work" as Tim Gunn would say! You've made some really nice pieces since I've been gone on vacation...I'm really excited about starting my fall/winter sewing! Glad I'm home and thanks for the tip on the heming, that's a great idea! !